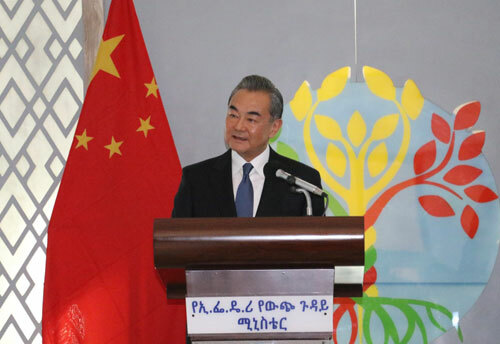 On January 3, 2019 local time, State Councilor and Foreign Minister Wang Yi and Foreign Minister Workneh Gebeyehu of Ethiopia jointly met the press after their talks in Addis Ababa. Wang Yi expressed that Chinese Foreign Minister has chosen Africa for the first overseas visit each year. The practice has lasted for 29 consecutive years, becoming a fine tradition of China's diplomacy. We have taken actions to demonstrate that China always adheres to placing Africa in an important position in the overall picture of China's diplomacy, and that strengthening cooperation with Africa and the vast number of developing countries is always the primary goal of China's diplomacy. Wang Yi said that the Beijing Summit of the Forum on China-Africa Cooperation (FOCAC) held last September was a great success, and the eight major initiatives outlined by the Chinese side charted the course and mapped out the blueprint for China-Africa cooperation. The main purpose of this visit is to communicate and integrate with African countries in adherence to the principle of sincerity, real results, affinity and good faith, and the values of friendship, justice and shared interests, put forward by President Xi Jinping, so as to jointly well carry out the implementation work of the outcomes of the FOCAC Beijing Summit and push bilateral relations and China-Africa comprehensive strategic cooperative partnership for constant and forward-looking development.